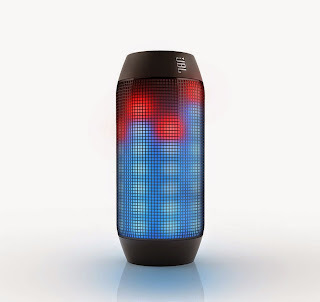 JBL Pulse The Most Fun and Unique - By Scott - JBL Pulse Wireless Bluetooth Speaker with LED lights and NFC Pairing. You might have read that the brights are bright, that the bass is a little weaker, and that at high volumes there's a little distortion. You didn't read wrong. It's a fine enough bluetooth speaker, but that's not the primary reason you buy this guy. It's the light show. And it looks just as awesome as these pictures would lead you to believe. It's small enough to fit in a sidebag or backpack without taking up too much space, it's big enough to adequately provide music for a day in the park or an impromptu party in someone's apartment, and it's flashy as hell. I have my audiophile tendencies/neuroses, but the sound is just good enough to keep me from being disappointed, especially whenever I look at the pretty colors flashing about. The downside is the battery life. If you plan on having a party going longer than 5~ hours, maybe you should think about some backup juice for this guy, because he won't make it. * Probs gonna get stolen in the park, it's too pretty, I'm gonna cry. Seriously. Verdict: Buy this and party. 0 Komentar untuk " JBL Pulse The Most Fun and Unique "